Gaming this week started with a new experience, the Richmond Board Gamer's Club on Monday night. Set up as the sister club to the IBG I've often read about their 'game of the month' envious that I couldn't get along. With Uni taking up Tuesday and Thursday evenings, IBG on a Wednesday meant that going out on a Monday too would, quite frankly, taking the piddle. Anyway, with Uni now over bar the assessment for the PGCert and my dissertation of course, Mondays become a possibility. 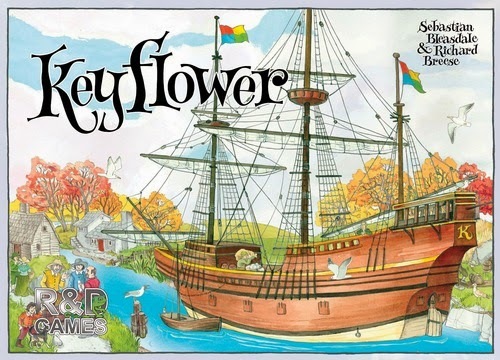 And 'gotm' for April is Keyflower, one of my favourite ever games! Ok, so that decision was based on only one play but hey, it's good to be opinionated sometimes isn't it? Even a slight contretemps with the game's main designer, Richard Breese, at last year's Essen hadn't swayed that opinion. I'd been told that the Triple Crown wasn't the most salubrious establishment in Richmond, and whilst not far from the truth the upstair's room was fine, quite light in fact, with a balcony and views over London Scottish Rugby Club's ground. Maybe we're lucky at IBG to be overlooking the Thames but it certainly wasn't a view to shy away from. I'd given IBG regular Andy a lift over and knew I'd meet a few chaps I'd played with in Isleworth. As it was, of the nine of us there for the evening, there was only chap I didn't know, and he was most pleasant. I just wish my amnesia hadn't taken his name away from me within seconds of being introduced to him, forgive me. So nine of us. Keyflower to be played, three copies, that's three threes, bizarre but there you go! I'd met Gary many, many times but apparently we'd never played a game together so it was good to put that right. And the three was made up by 'Victor' as I'll name him (foreshadowing that'll be). The game has several key mechanics (! ); auction, worker placement, modular board, network building, set collection, pick-up and deliver. That they all work together so well is a clever piece of design. There's also a lot of player interaction, and I've read that Breese feels this is very important. The theme is also consistent, good use of the seasons for the four rounds. I haven't even mentioned the artwork as yet. Breese's sister Julia has been his main artist for years, for the whole 'Key' game series, and the colours are always bright, restrained, clear. I love it. So, the game proceeded pretty quickly until winter was upon us. I felt I was doing ok but thought that Gary had so many resources he must have some high scoring bonuses hidden behind his player screen. And Vic - yeah, we were getting on well by this time - looked like his collection of powerful green meeples would put him into contention too. I'd expected him to outbid me with the greens and when he met those expectations I was able to move my pieces across to another more useful tile but then sat there smug rather than realising I had a further six meeples that I could place. Oh well. Game over. Scoring, mm, not bad, sixty-one. Gary had fifty eight, and Vic, well, sixty-three. Later, I realised I had another point having taken the first-player meeple for winter. If only... I'd utilised those unleashed meeples. If only. All that was forgotten however with a six-player For Sale. Another great game. Bid on thirty property cards numbered one to thirty, and then sell them for between $0 and $15,000. The bidding got ridiculous early on so I was forced to take a couple of low value properties but if you play these right later you can often get a good return on them. In the end I had $7,000 left of the initial $14,000 so that would be a help, as the others had used their capital completely with only one exception. At the sales things went well, my low value properties picked up brilliant returns and I managed to collect plenty of second highest value cheques too. Final scoring saw me reach forty-nine. Scott to my left - who normally wins every game he plays - had forty-six, and he turned out to be in second place, hurrah!! A good evening all told. I will be going back. 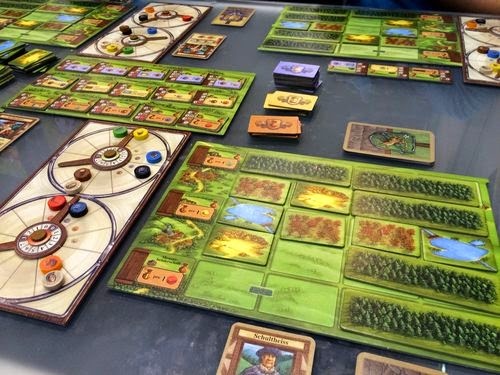 Then yesterday Josie played Glass Road with me for the first time and I then played three solo games of it too. My scores weren't great, 22 1/2, 23, 20 and 23. My highest to date is 27 1/2 but there's an American lady, Denise, on BGG who's played loads and has had two scores of twenty-eight recently so I was trying to reach that dizzy height. As it was I had another opportunity at IBG. Two newbies to the game and Philip, who picked up the Office building, as he always seems to do, and showed exactly how to use it. I completely blew this chance to score well and finished third with an 18, damn! Philip won with 24 1/2, Andy scored an excellent 19, and visiting policeman Anthony 12 1/2 although he'd learned a lot over the final two rounds. Philip, Andy and I then played Santa Cruz. It's by the designer of the excellent Verrater and Attika games but I have to say we all felt it was a bit of a non-event. Philip, who'd played before, decided that once you understand it, it's boring. He'd hoped for more from his second game. Andy, who won, was also unimpressed. Still, it's rare not to have a good experience so when you do at least you know the rest of time it's been great. Context see, it's everything.